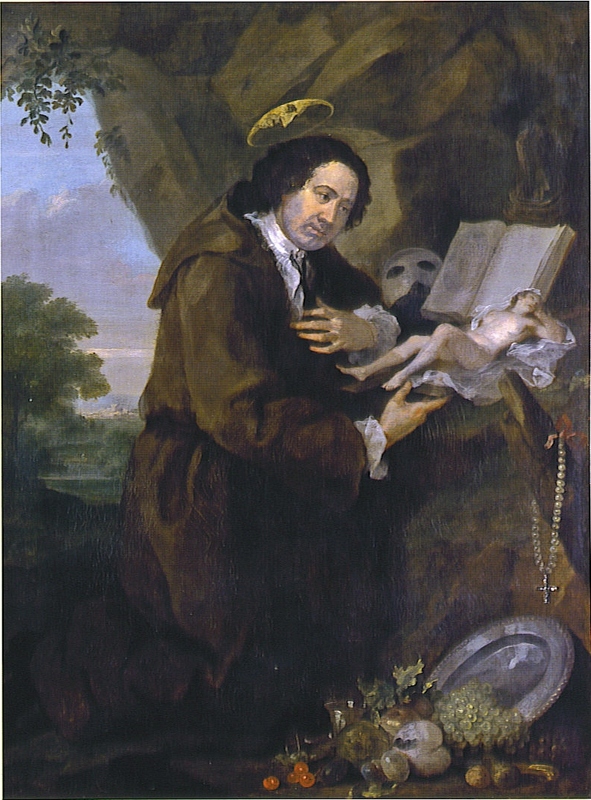 Sir Francis Dashwood worshiping Venus, with the Earl of Sandwich reflected in his halo.By Hogarth. Philip, Duke of Wharton was the trailblazer of all things Hell-fire, with his notorious Hell-Fire Club of the 1720’s. But his was by no means the only Hell Fire club, nor the most famous spawned in the enthusiastically libertine eighteenth Century. In the 1740’s a club was formed that became infamous as THE Hell-Fire club. A secret cabal made up of the landed elite and political opposition – a shadow government in waiting; rumored to hold secret Satanic rituals in a secluded abbey and nearby caves, engaging in blasphemous orgies where members, dressed as friars and nuns, met in all manner of fornication and adulteries. Eventually they took power in the ministry of Lord Bute, but soon over-reached themselves, and were ultimately betrayed by one of their own. Oh, and there was also a baboon involved along the way, as if all that wasn’t enough. Sounds like the perfect template for a Hell-fire Club- except that this particular Hell-Fire Club, wasn’t quite as devilish as it’s reputation suggested…and it’s founder was no latter-day Wharton, brilliant, bitter and blasphemous – nor yet some Georgian Crowley figure – he comes across as rather more, well, jolly. A traveler to foreign parts, a fan of dressing up, a bit of a practical joker, with a mixed up view of religion. Sir Francis dressed to impress, at the Divan Club. The mark of a gentleman in the eighteenth century, was to be clubbable. Societies and clubs sprang up like mushrooms in this very sociable century – if you had a particular interest, you could bet your life there was a group of like-minded fellows meeting in a tavern near you, on the second Tuesday of every month. If you couldn’t find a club to suit you, you could start your own – no matter what your tastes ran too. Sir Francis Dashwood, 15th Baron le Despencer, was no stranger to this eighteenth century trend. In 1732/3 after traveling in Italy and meeting the formidable Lady Mary Wortley Montague, he founded the famous Dilettante Society. Later, following a sojourn in the Ottoman Empire, where he again crossed paths with Lady Mary, he founded the Divan Club, which ran until about 1746. Later still, he founded the little known Lincoln Club which ran from the 1750’s to the 1770’s. These clubs focused on an aesthetic appreciation of the ancient and the exotic, ladies could be members. Fine dining and fancy dress were the order of the day (although there are no records of whether Lincoln green was required dress for the Lincoln Club) and there was much imbibing of alcohol, one would imagine. During his Grand Tour to Italy, Sir Francis got about a bit, he flirted with Jacobitism and meet with the Bonny Prince himself; he is also said to have developed an antipathy towards the more excitable aspects of Catholicism at that time, due in part to an over-zealous tutor. Penitents scourging themselves. 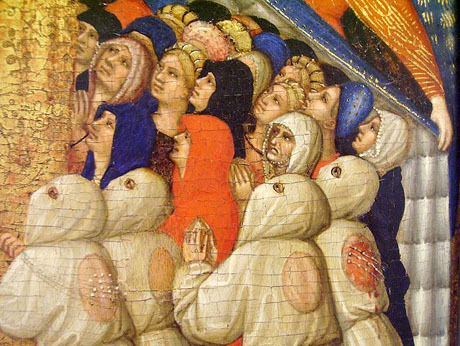 Detail of Madonna della Misericordia, 1418-1422 by Pietro di Domenico da Montepulciano, Musée du Petit Palais, Avignon. 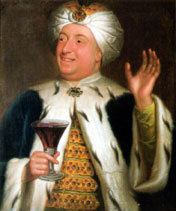 Back in England, having established himself as a man who was well-traveled, with a passing interest in the occult (his library contained a number of occult texts), irreligious by nature, fond of dressing up and keen on forming clubs, Sir Francis went on to form what would become one of the most notorious clubs in the eighteenth century. It was founded in 1746, and began life as Order of the Knights of St Francis of Wycombe, also known as the Monks or Friars of Medmenham. However posterity erroneously remembers it as The Hell-Fire Club. 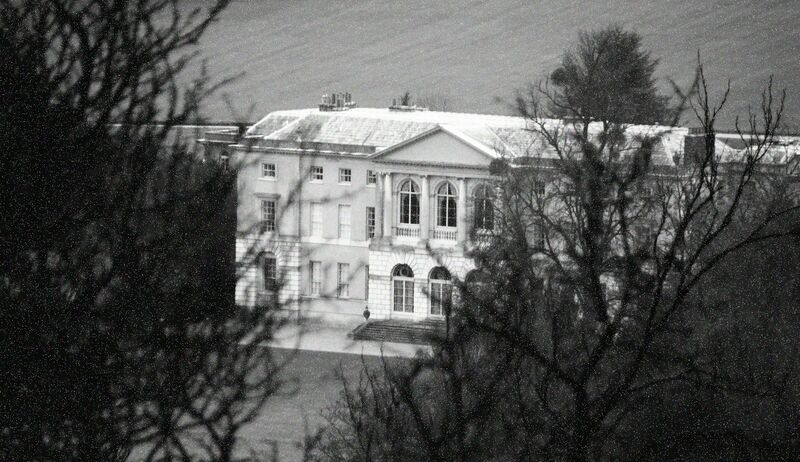 West Wycombe Park, glimpsed through the trees. (Image: Lenora). Like many private clubs at the time, it began life in a pub, the ominously named George and Vulture tavern at Cornhill in London. The private meeting room is said to have boasted a ‘Rosicrucian lamp, a large crystal globe encircled by a gold serpent, tail in its mouth, crowned with silver wings’ . The club proved popular, and Sir Francis soon sought to acquire more private accommodation for his illustrious members. Taking the club out to Buckinghamshire and his newly leased property of West Wycombe. The first meeting of the brotherhood was said to have taken place on Walpurgis night, 1752, much to the annoyance of Sir Francis’s prudish wife . Eventually, due to spousal pressure (?) the club began looking for more exclusive and more atmospheric premises. In the mid-eighteenth century all things Gothic were making a comeback, scholars and antiquaries were bringing ancient England into the public consciousness. Initially, as an architectural style, it was mocked as being in rather vulgar taste, something popular with ‘new money’ and rather going against the Classical tide of the century. It was not until Horace Walpole created his Mock Medieval Masterpiece at Strawberry Hill, that it became truly acceptable to the Bon Ton. To Sir, aka, Saint, Francis and his merry band of fornicating friars, a picturesque Gothic pile was just what the Order ordered. 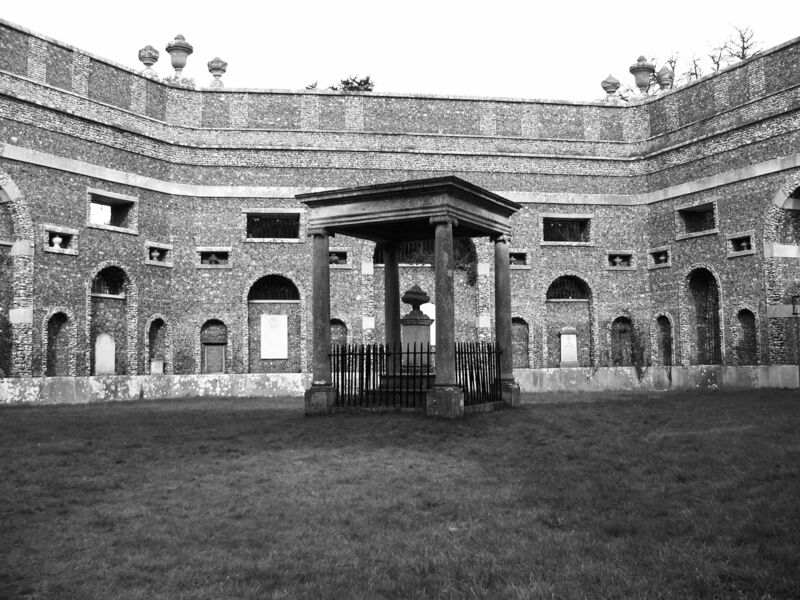 The Octagonal Mausoleum, featured in many Hammer Horror films. Image Lenora. 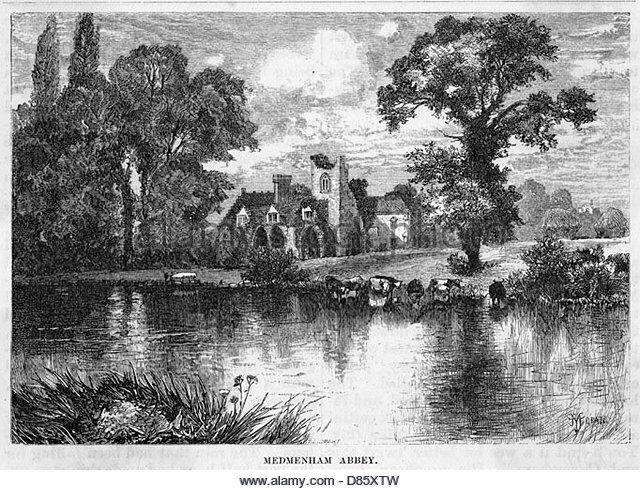 Medmenham had been a Cistercian Abbey, originally founded in the twelfth century. Like many such religious houses, it fell foul of that jolly old wife-killer, Henry VIII, and was sold to the Duffield family who remodeled and rebuilt it over the centuries. 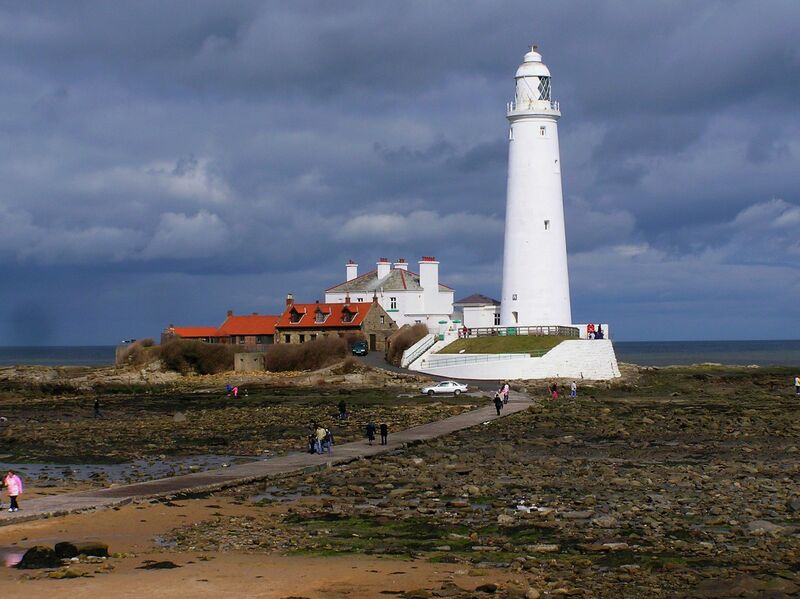 Sir Francis leased the Abbey from the Duffield’s in 1755 and began renovating the property to suit his peculiar tastes. He repaired the ruined cloister, tower and chapter house, a refectory, dining room and common room and catered for the ‘private devotions’ of the monks by providing them with their own ‘cells’. The ethos of the club was proudly inscribed above the main door ‘Fais ce que tu voudras’ – that ever popular Rabelaisian dictum ‘do as you will’ – thereby leaving no doubt as to the philosophy of its founder. Secrecy and voyeurism were also part of the ethos – the refectory was presided over by Harpocrates, the Greek god of silence and Angerona, the Roman goddess of secrecy. Apertures in the anteroom adjacent the dining room allowed secret observations. The costumes of the monks were described by Horace Walpole, who visited the abbey in the 1760’s. He described the chapter house as being decorated by prints of monks and nuns, pegs on the walls held their costumes: white hats, jackets and trousers, a red hat for the Prior. Looking, he thought, rather like the costumes of boatmen. Hardly the robes of Satanic devil-worshipers. The Secrets of the Convent c1763. Trustees of the British Museum. But what did the monks actually get up to? Was there any evidence of actual Satanic practices, or was it all just posh boys putting it about? There is little evidence of any really Diabolical practices, most of this comes from later rumors. Many of the documents relating to the club have been lost, the cellar book survives, and is a great source for identifying meetings, and prospective members, but has little on the actual ‘doings’ of the club. Dan Cruikshank, in his book on Georgian London, considers the possibility that Sir Francis may have been aware of antiquarian and later-day Druid, Rev William Stukeley and his theories about fertility rights and the Mother Goddess at Stonehenge. 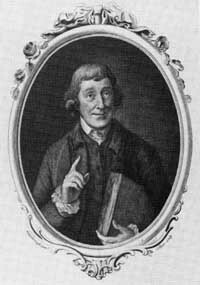 Stukeley re vivified the Druid movement, and interest in a pre- Roman Britain, naming himself Chief Druid in 1722. 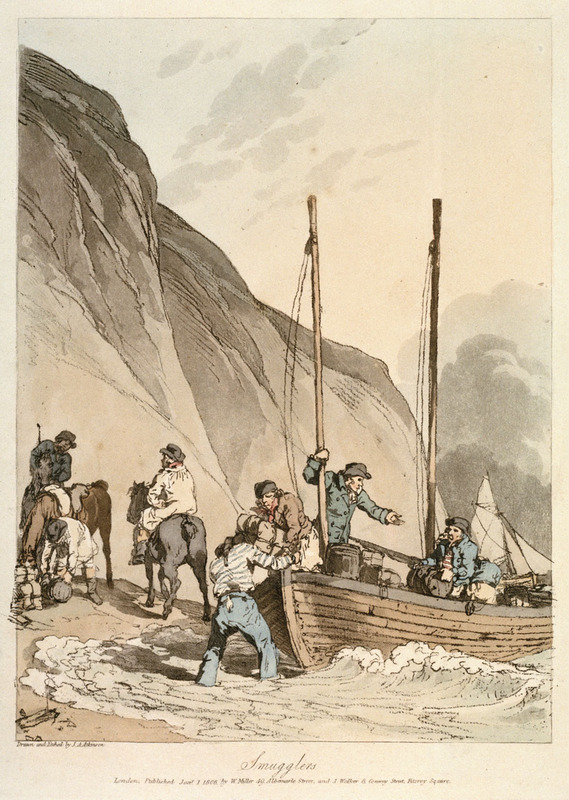 The Rakes Progress by Hogarth. Who were the Monks and Nuns of Medmenham? Paul Whitehead, Secretary of the Club. Sir Francis was the founder, but did not always act as the Abbot, this role seems to have been rotated amongst members of the inner circle. The loyal Paul Whitehead, known as The Aged Paul, was club steward, George Bubb Doddington was also a key member (and a bequest from him funded the completion of the octagonal Mausoleum). Later members include the notorious John Wilkes, whose political spat with fellow monk, and founding member, the Earl of Sandwich, would expose the activities of the club to censure and cement its notoriety in the public imagination. Chevalier d’Eon by Thomas Stewart. NPG. There have been many suggestions of other possible members, some more likely than others and encompassing both the famous and infamous of eighteenth century ‘celebrities’. From Benjamin Franklin, founding father of the USA and fan of the madness inducing glass harmonica, Chevalier D’Eon the sexually ambiguous cross-dressing French Spy, and George Selwyn the eighteenth centuries own necrophiliac ‘gentleman sadist’, to name but a few. 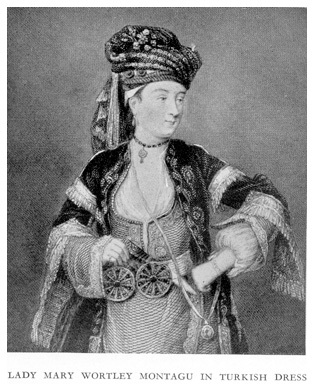 Lady Mary Wortley Montague, in Turkish Dress. 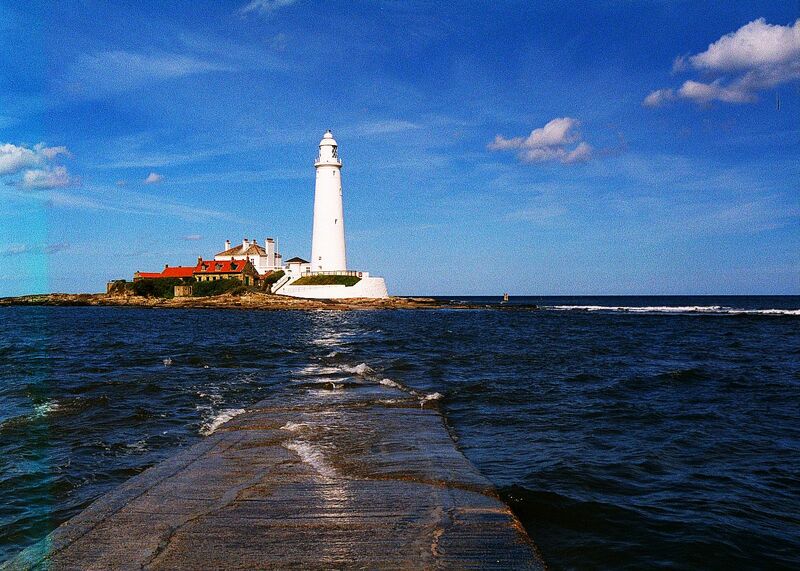 Ladies were also reported to be members, with the Lady Mary Wortley Montague being perhaps the most illustrious. She was certainly a member of Sir Francis’s other clubs, however it has been suggested her membership may have been honorary due to her advanced age, and the fact that she spent much of her time abroad. It was rumored that many noble ladies attended the club in disguise, in order to conduct affairs, and it would seem likely that many of the members would have brought their mistresses to partake of the delights of Medmenham. It also seems likely that Sir Francis was shipping in the creme of societies courtesans to act as naughty nuns. The beautiful Fanny Murray, famed courtesan and former mistress of the Earl of Sandwich, was almost certainly a member. Fanny Murray by Thomas Johnson. Via Wikimedia. The Medmenham Set have sometimes been seen as a sinister political cabal, pulling strings and being implicated in all manner of conspiracies. In fact, many of them did eventually take a role in government, in the ill-fated ministry of Lord Bute. The Friars certainly attracted many of disaffected ‘opposition’ during the period of Robert Walpole’s ‘Robinocracy’. The eventual undoing of the club occurred during a political cat-fight between the Earl of Sandwich and John Wilkes (a hell-raiser and famously known as the ugliest man in Britain). Wilkes also hinted that Pagan practices, by way of some form of English Eleusinian Mysteries dedicated to the Bona Dea (good Goddess), were performed. It was now open season for speculation, an updated version of Chrysal came out in 1766 elaborating and embroidering upon Wilkes’s revelations, and so the Hell-fire reputation began to form…and fiction became accepted as fact. The club limped on for a while, but political scandal and public censure took its toll. Curious tourists visited the Abbey post-Wilkes. But the memory of the Friars of Medmenham lived on, in fiction and the popular imagination. What was probably posh boys having naughty boozy weekends with perhaps a little light paganism thrown in, became the stuff of Hell-fire legend and infamy. The Mausoleum, where the heart of Paul Whitehead was interred. 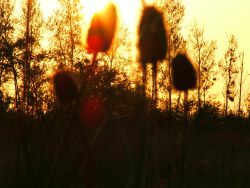 Image by Lenora. Dashwood, Sir Francis, ‘The Dashwoods of West Wycombe’, 1987, Aurum Press.